On his day off, failed writer / adulterer Rick Crawford, who has an almost comically unsuspecting wife, is pursued on and off the road by a mysterious biker –the guy’s face obscured and his intentions apparently murderous. Made on a miniscule budget by a filmmaker with a promising future, this zesty retool of Spielberg’s DUEL sadly adds the kind of clichéd padding that Spielberg cannily avoided, including a bog-standard faux-shock dream sequence. In an age when we’ve all had enough of post-modern genre pictures, it also clumsily highlights its own primary influence via two largely irrelevant characters discussing DUEL and its metaphorical qualities. 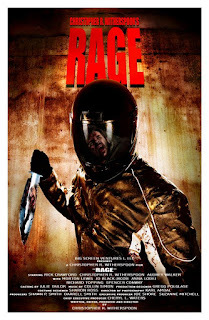 If the acting is of the ho-hum kind fairly characteristic of low budget indie horror pictures, the movie itself is very well edited and snappily paced, with a strong final half hour in which the mute, helmeted killer breaks out the chainsaws / screwdrivers and instigates the grimmest section of the movie by forcing Crawford to observe the violation of his cuckolded wife.